Many ESL students have trouble telling the difference between the question words they hear. This leads English learners to answer questions incorrectly. They mistake questions like “What do you need?” for “Why do you need it?” Or they think they hear “When are you going?” but they were actually asked “Where are you going?” To minimize misunderstandings, it’s good to practice the question words by saying them and hearing them. Below are the instructions for a game that can help you practice these English question words. Play a few rounds of this with your friends, and you can become really fluent in English questionspeak. 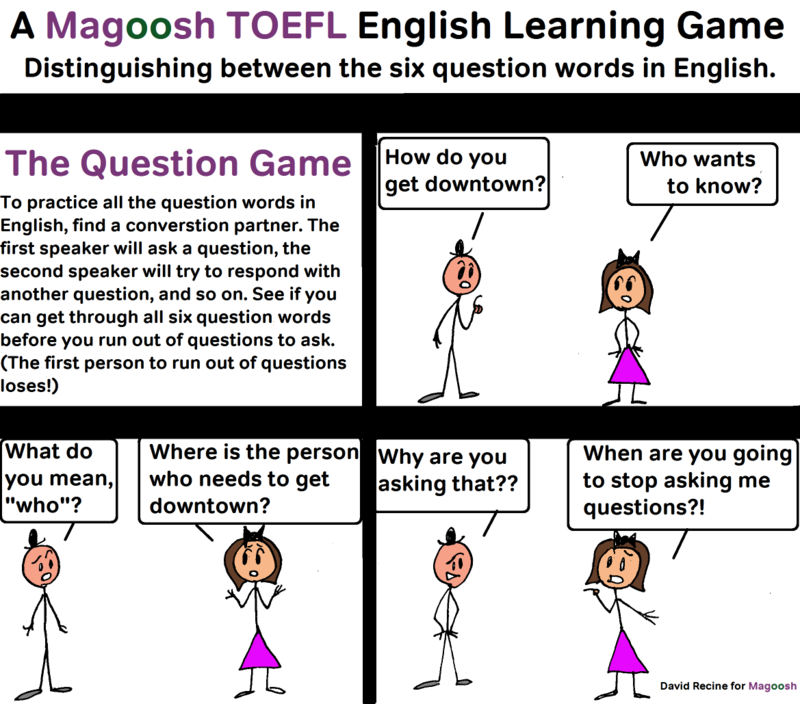 Magoosh Comics: Practice English Question Words with the Question Game. does the computer read each question for me after the audio stop? because I have a test practice that reach each question! Yes, each question is read aloud after the audio track. This is true in TOEFL Listening, Speaking, and Integrated Writing.